Name: Greek piar = fat + anthos = flower, referring to the fleshy flower. 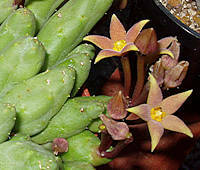 The genus Piaranthus was introduced by Robert Brown (1810) who described Piaranthus (Stapelia) punctata, although the combined name of Piaranthus punctatus was first published by Schultes (1820). 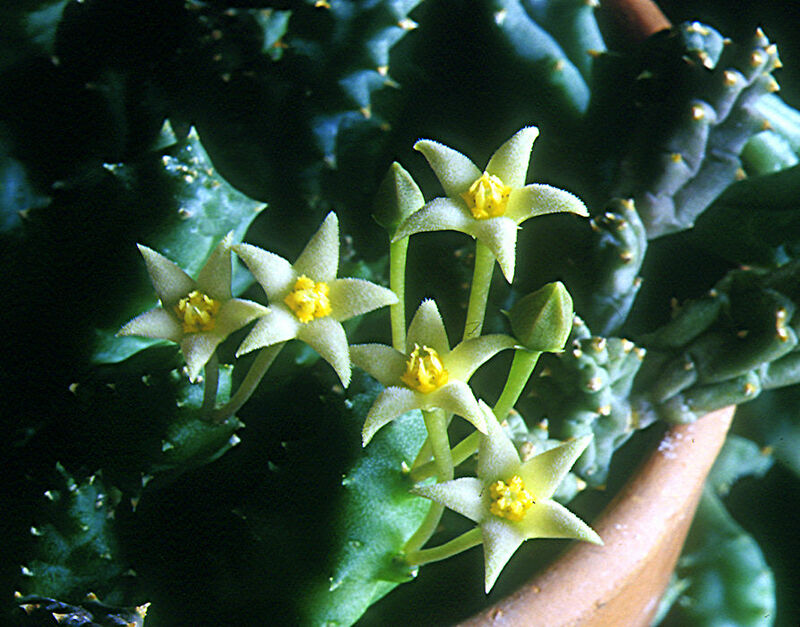 The genus has included as many as 16 species but currently comprises 7 species of small-stemmed mat-forming plants from South Africa and Namibia. Stems typically have four angles and the small but attractive star-shaped flowers have five independent petals. In habitat, they are typically found under protective non-succulent shrubs on sandy acidic soils. Most species occupy a range of 500 - 1000 m above sea level and receive 10 - 25 cm annual precipitation, much of it during the winter months. P. decorus grows at up to 1400 m and at the other extreme P. punctatus grows on coastal lowlands. A variable mat-forming succulent whose knobly, jointed light green stems have prominent tubercles along their edges. Clusters of flowers are produced near to the ends of the stems. Flowers are fleshy, 5-pointed stars with their colour ranging from cream to brownish with brownish transverse lines or speckles and a velevety texture. Native to the Cape Province of South Africa. Stem segments tend to detach at their joints. 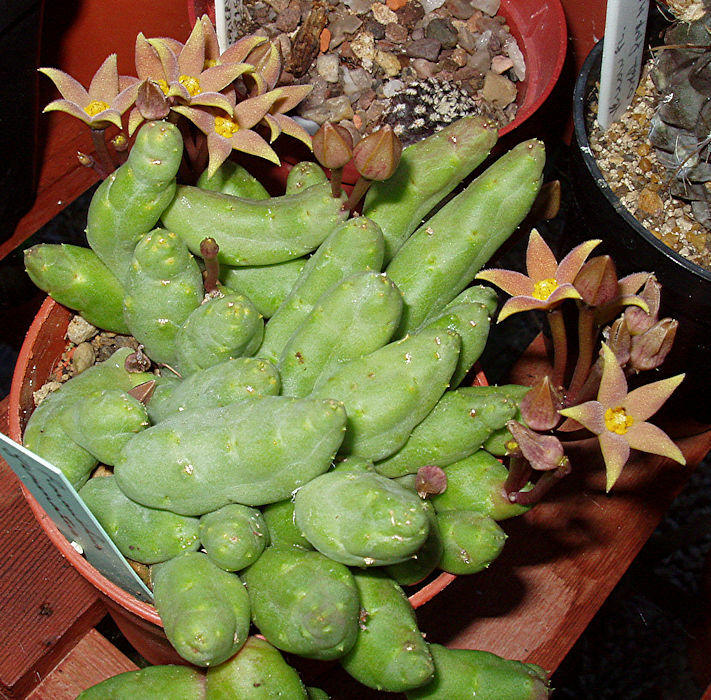 A variable species of mat-forming succulent with numerous synonyms. The light green stems are quite smooth with tubercles more or less promenent and clusters of flowers near to the ends of the stems. Flowers are fleshy, 5-pointed stars with their colour ranging from cream to reddish brown with brownish transverse lines or speckles to a variable extent or none and a velevety texture. Cultivation is relatively easy and similar to that for Huernia. Piaranthus prefer partial shade rather than full sun, mimicking their growth habit under shrubby vegetation. Flowering is induced by decreasing daylength and most species flower relatively late in the summer or autumn, except for P. barrydalensis which flowers in the spring - early summer. Perhaps because their natural flowering season is relatively late when the days are becoming cold, Piaranthus seem rather shy to flower in an English climate. The flowers have a odour reminiscent of rotting vegetation or in some cases (e.g. P. punctatus) a sweetish perfume.